This die requires the large Cuttlebug, or Empress plates. Anna Griffin FANTASTIC FLIPS Dies 7 Cut & Emboss Dies With Butterflies NICE!!!! Anna Griffin FANTASTIC FLIPS Dies 7 Cut & Emboss Dies NICE!!!! New Anna Griffin4 mix & matchEmbossing Folders. (1)Belle & Boo 8 x 8 Decoupage Pad 24 sheets 10 designs 3 of each die cut. Universal machine compatible including Cuttlebug,Big Shot,Spellbinders Wizard and more. Follow manufacturer's instructions for thin cutting dies. Product Uses: die cutting,card making, scrapbooking, embossing, invitations, handmade cards,paper crafts. Anna Griffin Wedding Card Kit Complete with everything you need to make 4 cards with envelopes. Anna Griffin® Empress Die Cutting and Embossing Machine Bundle. For truly Empress-ive crafting, reach for this sleek, stylish die cutting and embossing machine from Anna Griffin. Empress Die Cutting and Embossing Machine. Anna Griffin Cuttlebug CONGRATULATORY WISHES Cutting Dies and Embossing Folders - 20 Dies, 3 Folders. Looking for the right words to include on your cards, décor and scrapbook pages?. This is the second set in the 2017 series from Anna that starts with the "Wishful Thinking" die set. Trending at $29.95eBay determines this price through a machine learned model of the product's sale prices within the last 90 days. 10 - Bohemian Cut and Emboss Dies. Anna Griffin Jacket Damask Die Set. Wrap your cards in intricate designs and sophisticated details with this Jacket Card Die Set from Anna Griffin. Designed to work with the Anna Griffin Empress Machine with large plates. Anna Griffin Good Luck Card Kit-Great for Graduation! Anna Griffin Good Luck Card Kit Complete with everything you need to make 4 cards with envelopes. Great for graduation cards! 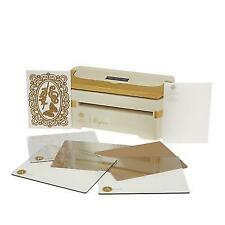 Anna Griffin® Gold/Ivory Cricut Cuttlebug™ Version 3 with Folder and die set!! Anna Griffin® Gold/Ivory Cricut Cuttlebug™ Version 3. Make a great impression — and a professional-looking cut — with this crafty little Cuttlebug. Use the embossing and die-cutting machine with paper, foil and even leather to add texture and detail to all your projects. You adore Anna Griffin's designs for their classic, sophisticated style, so discover a colossal set of crafting options with this Cuttlebug bundle. Create more of what you love. - 5" x 7" embossing folder with 1" x 7" embossing border - Cane Paisley. ANNA GRIFFIN CHRISTMAS Words and Phrases Cutting Dies. 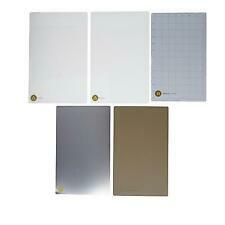 2 5" X 7" EMBOSSING FOLDERS each with 3 different embossing designs. THE CHRISTMAS WORDS DIE SET INCLUDING 2 EMBOSSING FOLDERS. 9 LARGE WORDS & PHRASES. Cricut Cuttlebug ANNA GRIFFIN Embossing folder set~ALL ABOUT HIM~Quick Ship!! ALL ABOUT HIM. It's really cute & useful! For size see ALL pictures cards shown are for idea purposes only and are NOT included . A Set Of Anna Griffin Cricut Cuttlebug Cardstock Die Cuts. There are 2 pieces included in the set. 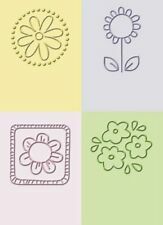 Perfect Die Cuts for card making , scrapbooking and craft projects. Other colors are available. The following color options are in stock: white, cream, light pink , dark pink, red, black, blue, orange, yellow, brown, grey , silver, gold and purple. Please message me with your color choice. Cuttlebug 5x7 Embossing Folder & Border, Wildflower Gate. A design from Anna Griffin, the Wildflower Gate embossing folder and border showcase a freeform bouquet of lush flowers. Use the 5x7 folder and coordinating 7" border to add floral texture to all your projects. Anna Griffin Fancy Flip Dies & Embossing Mat. Condition is New. Shipped with USPS Priority Mail Flat Rate Envelope. Anna Griffin die. Condition is Used. Shipped with USPS First Class Package. Layer on the creativity with these 3D embossing folders from Anna Griffin®. The three stylish designs are inspired by the look of tooled leather, making them a bold way to embellish any project. 1 3D embossing folder - Tooled Ribbon. Bring handmade cards to life with Anna Griffin's Window Box Cards. Fun structural designs featuring attachable and movable inserts combine with Anna's beautifully intricate style to help your projects pop in a big way! Four 5 X 7 (approximate size) embossing folders with a 1 X 7 (approximate size) border as follows. Put the crowning touch on your projects with perfect bows and rosette bows. 2 piece die set includes:rosette bow and small bow. Designer artwork by Anna Griffin Features 3-D bow designs. Anna Griffin Cut and Emboss Dies PRETTY BOWS. A Set of (5) Anna Griffin card sentiment layers. Blank Layers. Perfect layers for card making, scrapbooking and craft projects. Other colors are available. The following color options are in stock: white, cream, light pink , dark pink, red, black, blue, orange, yellow, brown, grey , silver, gold and purple. Please message me with your color choice. Punch out and layer for a beautiful 3D effect. Array of masculine detailed shapes. Country of Origin: China. 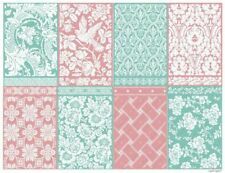 Cricut Cuttlebug varieties~ANNA GRIFFIN~BNIP~5x7~Embossing Folder~Fast Ship!! STUNNING......AND RARE. An embossed cardstock layer created using Anna Griffin Cricut Cuttlebug Embossing Folder . Perfect layer for card making, scrapbooking and craft projects. Other colors are available. The following color options are in stock: white, cream, light pink , dark pink, red, black, blue, orange, yellow, brown, grey , silver, gold and purple. Please message me with your color choice. Looking to add interest and appeal to an upcoming project?. Add a little elegance with antique-inspired imagery! Anna Griffin brings you early Victorian fashion and paper dolls that can be simply punched out and layered for a beautiful 3D effect. Diecut collection. A storage folio tucks these pretty petals away until you're ready to make your paper garden grow. Country of Origin: Imported. Foam adhesive squares. Long Stems are ideal for "fitting" into the pockets. 14-piece set of dies and embossing folders designed by Anna Griffin. •5" x 7" Paper Tricks Circle & Ribbons Emboss Folder. •8 Cutting dies. •5" x 7" Paper Trick Chevron & Fan Fold Emboss Folder. •5" x 7" Paper Trick Squares Emboss Folder. STUNNING......AND RARE. A Set Of (2) Cardstock layers. The embossed cardstock layers were created using Anna Griffin Cricut Cuttlebug Embossing Folder and Die Cut. Perfect layers for card making, scrapbooking and craft projects. Other colors are available. The following color options are in stock: white, cream, light pink , dark pink, red, black, blue, orange, yellow, brown, grey , silver, gold and purple. Please message me with your color choice. Looking to grow fabulous, flourishing projects?. With these gorgeous 3D embossing folders from Anna, you'll be able to create gatefold cards with ease. Just emboss, fold and embellish your way to seriously sumptuous crafts. Celtic Link embossing folder by Anna Griffin for Cuttlebug is a unique pattern that can be used for any occasion. Universal machine compatible including Cuttlebug,Big Shot,Spellbinders Wizard and more. There's nothing like fringe b enefits! Create stunning invitations, décor, favor boxes, place cards, and much more, all designed by Anna Griffin®.